Ireland’s booming economy is attracting a new influx of foreign nationals while the number of people at work in the State is now nearly 20,000 higher than it was before the crash, new figures from the Central Statistics Office (CSO) show. The CSO’s latest population statistics show that of the 90,300 people who immigrated here in the 12 months to April, two thirds (61,900) were foreign nationals while the remainder were Irish nationals returning to live in the Republic from abroad. “The ongoing tightening of the Irish labour market is attracting migrants into the country at rates not seen in a decade,” Goodbody analysts Dermot O’Leary said. 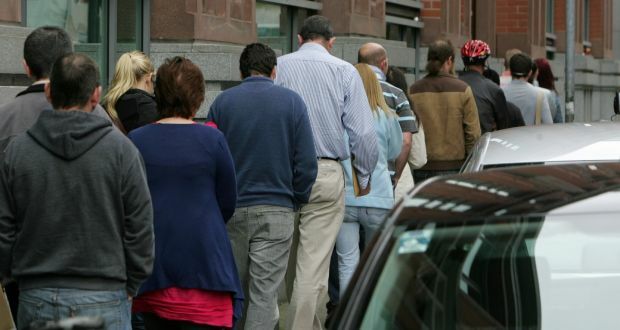 The figures coincided with the CSO’s latest Labour Force Survey, which show there were 2.255 million people at work in the economy in the second quarter of 2018, up 3.4 per cent or 74,100 year on year. While employment of Irish nationals grew by 2.3 per cent, employment of foreign nationals grew by 9.7 per cent. Employment rose in 10 of the 14 economic sectors surveyed with the greatest rates of increase in the construction (+13.9 per cent or 17,800) and the accommodation and food service activities (+10.8 per cent or 17,300) sectors. The pre-crash peak in employment, recorded in the final quarter of 2007, was 2.237 million. The new population numbers caused the State’s official unemployment rate to be revised up from 5.1 per cent to 5.9 per cent. This is the second time in less than a year that the CSO has been forced to make a significant revision to the jobless rate here. Nonetheless the figures still point to a healthy level of job creation and an onoging decline in headline unemployment. In total, there were 144,300 people classified as unemployed in the second quarter of 2018, down 10 per cent or 16,200 on the same period last year, albeit this was the slowest rate of decline in unemployment in several years. “In light of the scale of recent revisions to the monthly unemployment rate, the CSO is preparing to review the existing methodology used to forecast these estimates,” it said. The figures show labour force participation rose marginally to 62.3 per cent but was still 4-5 percentage points below its pre-crash peak. The strong surge in employment growth is expected to drag more people into the labour force, picking up some of the slack in the market before the economy hits full employment. Long-term unemployed, which refers to people out of work for more than a year, accounted for nearly 34 per cent of total employment in the second quarter. “The rise in employment appears far from over,” Merrion analyst Alan McQuaid said. “Although emigration has been a factor to some degree in keeping unemployment down since the financial crisis, the labour market has improved dramatically over the past few years, reflecting the strengthening of the economic recovery,” he said.